June’s short story collection is due in 2017 with New Island Books. Her story SOMAT is published in the award-winning The Long Gaze Back – An Anthology of Irish Women Writers edited by Sinéad Gleeson and was chosen as a ‘favourite’ by The Sunday Times. Shortlisted and/or Highly Commended for: The Colm Toíbín International Short Story Award; Lorian Hemingway (USA); Sunday Business Post/Penguin Ireland Short Story Prize; RTÉ Guide/Penguin Ireland short story competition; Over The Edge New Writer of the Year. She is a recipient of a John Hewitt bursary and an Arts Council of Northern Ireland (ACNI) literature award after completing an MA in Creative Writing at Queens’ University, Belfast. 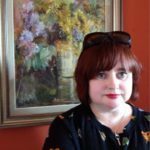 Her short fiction is published in The Moth, The Stinging Fly, Sixteen Magazine, Literary Orphans, RTÉ Ten, The Bogman’s Cannon, North West Words, Woven Tale Press, and Popshot Magazine, as well as a biography of a Trouble’s moll with Gill & MacMillan (2006). You can listen to June talking about writing short stories on Hen House with further mention of her writing on CBC Sunday Edition (Canada).